So Long, Nile! 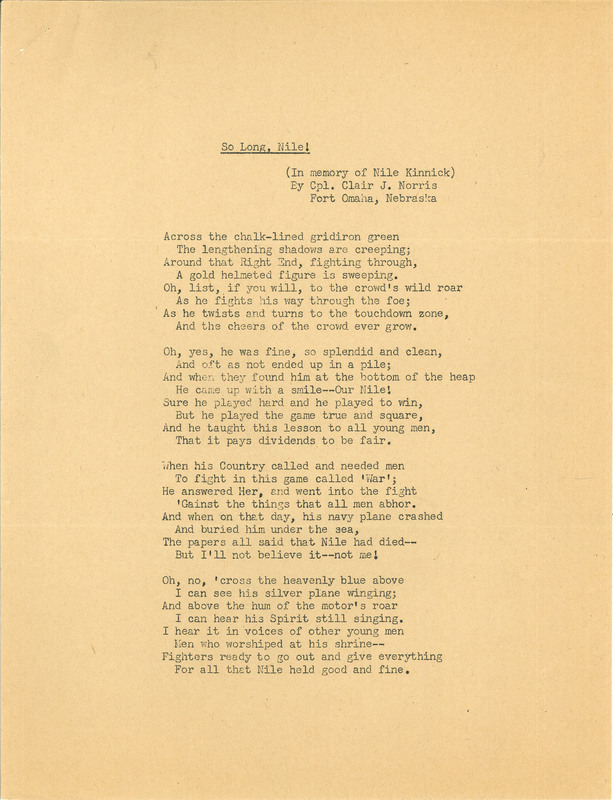 (In memory of Nile Kinnick) By Cpl. Clair J. Norris Fort Omaha, Nebraska Across the chalk-lined gridiron green The lengthening shadows are creeping; Around that Right End, fighting through, A gold helmeted figure is sweeping. Oh, list, if you will, to the crowd's wild roar As he fights his way through the foe; As he twists and turns to the touchdown zone, And the cheers of the crowd ever grow. Oh, yes, he was fine, so splendid and clean, And oft as not ended up in a pile; And when they found him at the bottom of the heap He came up with a smile--Our Nile! Sure he played hard and he played to win, But he played the game true and square, And he taught this lesson to all young men, That it pays dividends to be fair. When his Country called and needed men To fight in this game called 'War'; He answered Her, and went into the fight Gainst the things that all men abhor. And when on that day, his navy plane crashed And buried him under the sea, The papers all said that Nile had died But I'll not believe it--not me! Oh, no, 'cross the heavenly blue above I can see his silver plane winging; And above the hum of the motor's roar I can hear his Spirit still singing. I hear it in voices of other young men Men who worshiped at his shrine Fighters ready to go out and give everything For all that Nile held good and fine.